A public lavatory in Hainan. China’s southernmost island province of Hainan will soon have more public lavatories — to the delight of its many tourists. To address the shortage of facilities in public places on the island, the provincial government is paying a 50,000-yuan (7,570 U.S. dollars) subsidy for each newly-built public toilet. Though most welcome the initiative, few locals want a new public toilet near their house. To boost tourism on the island dubbed "China’s Hawaii," the local government will spend 200 million yuan to build 1,587 lavatories over three years. More than 520 public toilets were built this year. The island has a population of 6 million and attracts large numbers of Chinese and foreign tourists every year. Haikou, the provincial capital, will spend nearly 40 million yuan over the next two years to build more than 200 public toilets. Twenty-two of them will be renovations of old toilets in the city’s downtown area. Sanya, a popular tourist resort, will build 134 new toilets. A map of public toilets on the island will be given free-of-charge to both locals and tourists. Wang Yong, the mayor of Sanya, spent a lot of time trying to find a toilet in the city in March. Eventually, a seaside restaurant let him use theirs. "The restaurant boss let me in. But will ordinary people enjoy the same treatment?" Wang asked. The issue has affected the image of the government, he said. The people want more public toilets with private space and facilities for the disabled, he added. 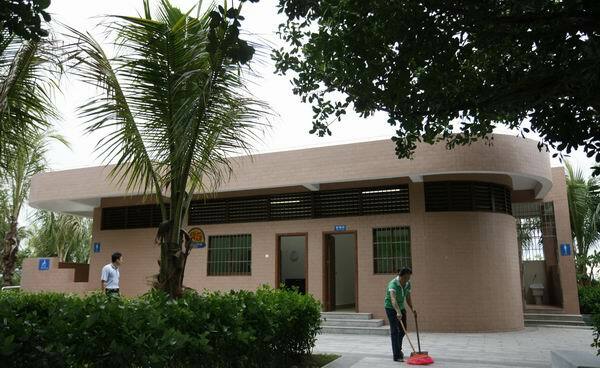 Wei Liucheng, the Party secretary of the province, said public toilets are a symbol of modern civilization. He also said they are important to the island’s development as an international tourist Mecca. Some lavatories were vandalized soon after they were set up in some communities. Glass in eight lavatories was smashed and more than 100 taps went missing after only a few days, said Qian Zhongming, director of Sanya’s sanitation bureau. He said that showed people do not want public toilets close to where they live. "At present, we don’t have much space for public toilets because land-use rights have been sold to real estate developers," said Huang Shengcun, director of the urban administration of Qionghai City. "If land development authorities have had thought about the issue, we would not have encountered such a tough problem," Huang said. The toilet-building campaign has also coincided with a "civilization revolution" that urges locals and tourists to be considerate when using the public facilities. "There used to be free toilet paper. But people stole it. So we had to abolish the measure," he said. The toilets’ construction has challenged the government and the public, said Rong Liping, vice mayor of Sanya. Rong said the government hopes to improve people’s habits on the beautiful island. Rong said environment and sanitation courses will be taught at Sanya’s primary schools and that tour guides will be required to instruct tourists on the relevant regulations. "The toilet construction campaign has exposed some of Hainan’s problems. We must find ways to get rid of them," said Qian.